I switched narrator's. Not because I wanted to, but because the library lost the rest of the audio books for HP and so my husband got them for me. How nice! Yet, the narration does not compare well against Jim Dale. I mean seriously. I almost threw my iPod like a child because I didn't like his voice as well. Jim Dale is a genius! I've never heard a story told like he can! But, I wasn't listening to Jim Dale this time. I had Stephen Fry. He's not bad, but he isn't as good. Period. It took me several chapters to get use to him. He's much more bland. That being said, the story is great! I sure do love me some Harry Potter and I am enjoying going through the series again. There is such magic here. The descriptions are out of any other writer's league! The imagination used to conjure up some of this stuff is sheer brilliance! I'm listening to the audio books as I clean the house, walk into town with the baby, and work on blog stuff in the evenings. I like it because I normally wouldn't be reading at that time. No matter if I could read faster than the narrator is speaking, I wouldn't be reading at all! So, I feel like I'm cheating getting some extra story time in. Kill two birds with one stone. I love it! 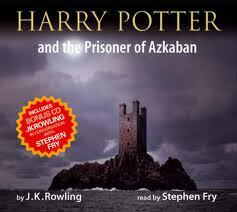 If you've not tried audio books, you should start with Jim Dale's narration of Harry Potter! You won't be disappointed!